Eclipse is an Open Source community, whose projects are focused on building an open development platform comprised of extensible frameworks, tools and runtimes for building, deploying and managing software across the lifecycle. The result is a platform based on public APIs and plugins whose development specifications are in the public domain and it allows anyone to develop their own plugins and make them available to the Open Source community or create special versions for a fee. Today Eclipse is the best known and used development platform in the Java world. The Eclipse Project was originally created by IBM in November 2001 and supported by a consortium of software vendors. 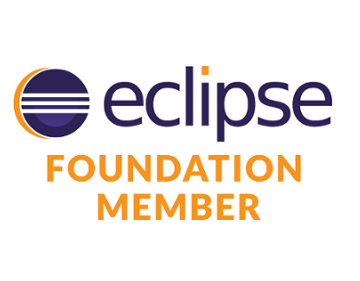 The Eclipse Foundation was created in January 2004 as an independent not-for-profit corporation whose mission is to administer and support both the open source community and an ecosystem of complementary products and services. To date hundreds of companies are part of the Eclipse Foundation, such as IBM, itemis, Nokia, Oracle, SAP, BleckBerry, Adobe, BMW, Cisco, Google and many others, whose support creates many important Eclipse Projects. From early 2010 RCP Vision became a member of the Eclipse Foundation. This event marked the end of the first year (or so) life of the company, and it is for us the time to make a first small budget. Some years ago we started working with the Eclipse community, first with the production of tutorials on Eclipse RCP and Eclipse Modeling Framework, and then as committer of Open Source projects related to the Eclipse world. Today we have our Eclipse project, EMF Parsley. We joined the campaigns of Demo Camp in June and December 2009, organizing two events in Florence at the same time of international campaigns organized by the Eclipse Foundation around the world. Moreover, since 2012 we have organized the Eclipse Day Florence and it has now reached its third edition. Since October 2009 we have become Italian Mirror of Eclipse, with the acquisition of dedicated servers and bandwidth. This was another important step that RCP Vision has made for the Eclipse community in Italy. Thanks to all these commitments with the international community of Eclipse, RCP Vision has become a reference for those who use Eclipse technologies in Italy. We have gained many new clients and we have promoted the spread of advanced software development techniques based on the Eclipse framework. Our staff has grown and, thanks to the passion and the skills of all the team members, we have started lots of new successful projects based on Eclipse RCP platform, some of which are based on techniques of Model Driven Architecture. RCP Vision is specialized on the use of EMF (Eclipse Modeling Framework), planning some pre-packaged solutions that have helped our clients choose to use advanced modeling techniques for new projects, with a level of satisfaction they were not accustomed to. The Agile development techniques, the Test Driven Development and the Continuous Integration are a must for our modus operandi. From architectural and technological consulting, to Turnkey Application Development, we always look for the best design techniques and coding. The winning aspect that sets us apart is the fact that the client becomes an integral part of the process of software production: from the requirements analysis phase, where the client work with our specialists, to the development phase, in which a client’s resources contribute to the realization accompanied by our qualified staff. Our work is always characterized by a high quality final product, thanks to close cooperation with the client, to the rapid reaction to changes that shape the product during construction and through testing, that consolidate the various stages of development.